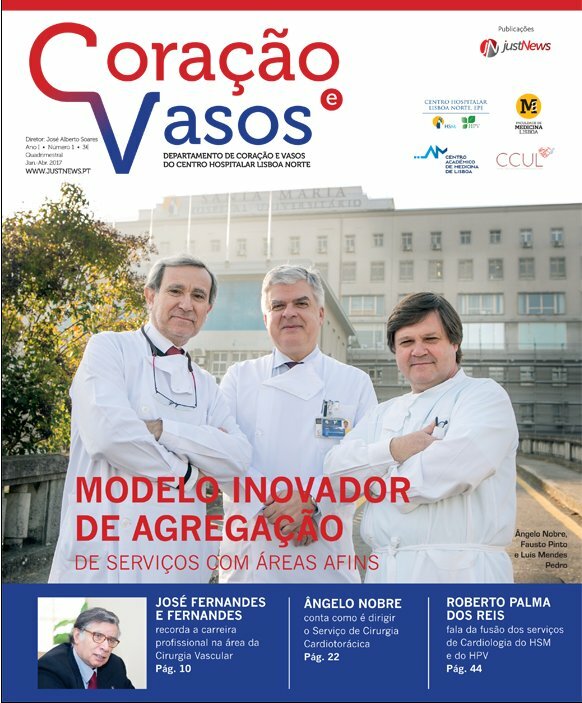 The Department of Heart and Vessels of the Northern Lisbon Hospital Centre (CHLN) started publishing the journal Coração e Vasos whose contents reflect its innovative and ambitious activity. The Department of Heart and Vessels, created in 2015, is part of the Cardiology, Vascular Surgery and Cardiothoracic Surgery units, directed, respectively, by Professors Fausto Pinto, Luís Mendes Pedro and Ângelo Nobre. This journal, which is published on a quarterly basis, is not only intended for CHLN professionals, but also for all similar services of other national hospital units. Its distribution will not be limited to the above-mentioned entities but will also extend to the primary health care network of the Regional Health Administration of Lisbon and Vale do Tejo (ARSLVT), aiming to sensitize family physicians to offer a better diagnosis and subsequent referral of cases to the aforementioned Department. In the opinion of Professor Fausto Pinto, this Department “represents an innovative model of aggregation of services with related areas, which complement themselves with the objective of focusing the activity and intervention capacity of these three medical disciplines on the patient, together defining objectives and strategies in the cardiovascular field, enabling a more effective and innovative approach based on teamwork and cooperation“.